For other uses, see Brentford (disambiguation). 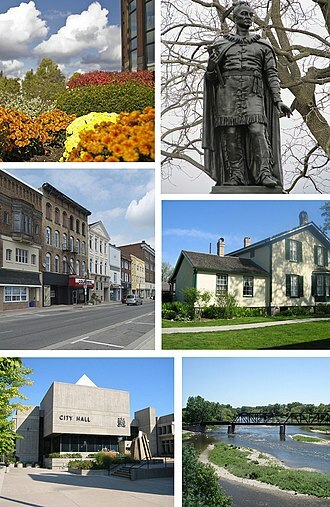 Not to be confused with Brantford or Brentwood, Essex. Brentford (/ˈbrɛntfərd/) is a town in western Greater London, England, the contested county town of Middlesex and part of the London Borough of Hounslow. It lies at the confluence of the River Brent and the Thames, 8 miles (13 km) west-by-southwest of Charing Cross. It has formed part of Greater London since 1965. Its economy has diverse company headquarters buildings which mark the start of the M4 corridor; in transport it also has two railway stations and Boston Manor Underground station on its north-west border with Hanwell. Brentford has a convenience shopping and dining venue grid of streets at its centre. 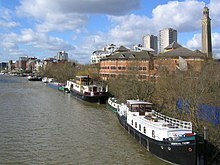 Brentford at the start of the 21st century attracted regeneration of its little-used warehouse premises and docks including the re-modelling of the waterfront to provide more economically active shops, townhouses and apartments, some of which comprises Brentford Dock. A 19th and 20th centuries mixed social and private housing locality: New Brentford is contiguous with the Osterley neighbourhood of Isleworth and Syon Park and the Great West Road which has most of the largest business premises. The name is recorded as Breguntford in 705 in an Anglo-Saxon charter and means 'ford over the River Brent'. The name of the river is Celtic and means 'holy one' and the '-ford' suffix is Old English. The ford was most likely located where the main road crossed the river. New Brentford is recorded as Newe Braynford in 1521 and was previously known as Westbraynford. Old Brentford is recorded as Old Braynford in 1476 and was previously known as Estbraynford. 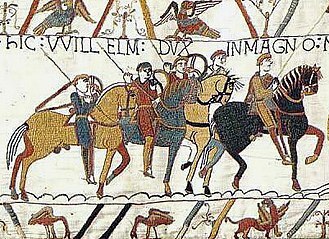 The settlement pre-dates the Roman occupation of Britain, and thus pre-dates the founding of London itself. Many pre-Roman artifacts have been excavated in and around the area in Brentford known as 'Old England'. Bronze Age pottery and burnt flints have been found in separate sites in Brentford. The quality and quantity of the artefacts suggests that Brentford was a meeting point for pre-Romanic tribes. One well known Iron Age piece from about 100 BC – AD 50 is the Brentford horn-cap – a ceremonial chariot fitting that formed part of local antiquarian Thomas Layton's collection, now held by the Museum of London. The Celtic knot pattern (the 'Brentford Knot') on this item has been copied for use on modern jewellery. 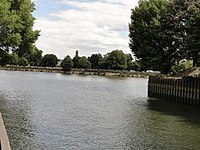 Brentford is the first point on the tidal portion of the River Thames which was easily fordable by foot (this was before dredging took place). 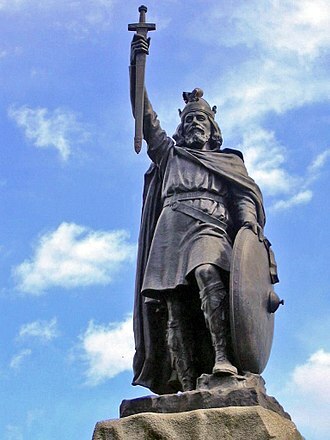 Partly for this reason it has been suggested that Julius Cæsar crossed the Thames here during his invasion of Britain in 54 BC, and the Brentford Monument outside the County Court asserts that a battle took place here at this time between Cæsar's forces and Cassivellaunus. In his own account, Cæsar writes that he crossed the river 80 miles (130 km) from the sea, and Brentford is this distance from his supposed landing beach. He further states that the river bank was protected by sharp stakes. During the building of Brentford Dock many such oak stakes were discovered. Dredging the river uncovered so many more that they had to be removed, for they were a hazard to navigation. Although Cæsar's descriptions are compelling, there has been no archaeological proof that this was the spot where he and his army had to fight to cross. 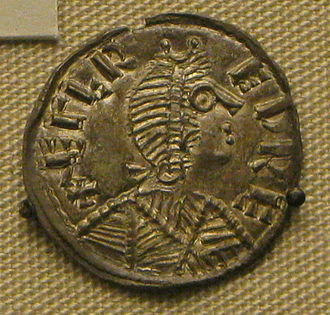 It must also be kept in mind that Julius Cæsar's own accounts suffered in some part to his embellishment of the facts. The building of Brentford Dock was started in 1855 and it was formally opened in 1859. The dock yard is now a Marina and housing estate. A notable family from Brentford was the 18th/19th century architectural father and son partnership, the Hardwicks. Thomas Hardwick Senior (1725–1798) and Thomas Hardwick Junior (1752–1829) were both from Brentford and are buried in the old church of St Laurence. Hardwick Senior was the master mason for the Adam Brothers during the construction of Syon House. Hardwick Junior assisted in the building of Somerset House and was known for his designs of churches in the capital. He was also a tutor of J.M.W Turner whom he helped start Turner's illustrious career in art. Both father and son did a great deal of remodelling and rebuilding on the church of St Laurence. 54 BC Brentford is a likely site of a battle recorded by Julius Cæsar between Julius Cæsar and the local king, Cassivellaunus. 1616 – 1617 Pocahontas (birth name: Matoaka), Pamunkey princess, resided in Brentford with her husband, John Rolfe and son Thomas. 1682 A very violent storm of rain, accompanied with thunder and lightning, caused a sudden flood, which did great damage to the town of Brentford. The whole place was overflown; boats rowed up and down the streets, and several houses and other buildings were carried away by the force of the waters. 1815 – 1817 John Quincy Adams, sixth President of the US, lived in Brentford. 1828 William Corder was arrested on Wednesday 23 April at Everley Grove House, Ealing Lane in Brentford, for the notorious Red Barn Murder. 1859 Start of operations of the Great Western & Brentford Railway, built in part on James Montgomrey’s land and linking Brentford Dock to the Great Western Railway main line at Southall. Additional passenger station named 'Brentford Town' later constructed just north of Brentford High Street. 1 January 1929 – Grand Junction Canal bought by the Regent's Canal and amalgamated with other canals to form the Grand Union Canal. 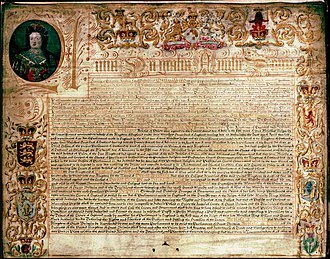 New Brentford was first described as the county town of Middlesex in 1789, on the basis that it was the location of elections of knights for the shire (or Members of Parliament) from 1701. In 1795 New Brentford (as it was then) was "considered as the county-town; but there is no town-hall or other public building" causing confusion that remains to this day. Syon House, the Greater London residence of the Duke of Northumberland, is a large mansion and park in Syon ward, described above, that has long been shared with Isleworth. Some of its seasonally marshy land is now a public nature reserve. The estate has a hotel (Hilton London Syon Park), visitor centre and garden centre. Syon Abbey, demolished and replaced (with reworked gatehouses) by the newer mansion, had the largest abbey church in England in the Middle Ages. The location of Syon Abbey in the park was unknown until archeological investigations in the grounds in 2003 (for the television series Time Team) and 2004 revealed the foundations of the abbey church. 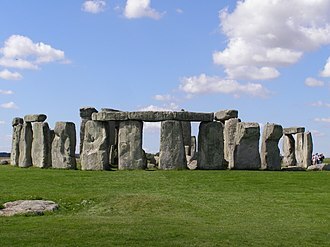 It was larger than Westminster Abbey is now, but no above-ground structure remains. There were complex reasons for its destruction. The London Butterfly House in Syon Park was an insectarium like a large glasshouse containing a butterfly zoo. Visitors could see butterflies and moths flying about, feeding, and emerging from chrysalises. There was also a colony of large ants (kept with the butterflies), a small tropical bird aviary, and a small gallery of reptiles, amphibians, insects and spiders. The lease on the current site expired in October 2007 and the Butterfly House closed on 28 October. Syon Park House (demolished in 1953, and not to be confused with Syon House itself) housed the 'Syon Park Academy' where the poet Percy Bysshe Shelley was educated between the ages of 10 and 12 before moving on to Eton. A Royal Mail depot stands on the site now. This may also be the site of the dwelling where Pocahontas lived in Brentford End between 1616 and 1617. In 1909 a monument was made out of two stone pillars that used to support lamps on the old Brentford bridge over the Grand Union Canal. The monument originally stood at the end of Ferry Lane; after being covered in coal unloaded from boats, it was moved further up the lane in 1955. In 1992 it was moved again to its present site at the junction of Brentford High Street and Alexandra Road, outside the County Court. The monument commemorates four major events in Brentford's history: the supposed crossing of the Thames by Julius Caesar in 54 BC; the council of Brentford by King Offa of Mercia in 781; the defeat of King Canute by King Edmund Ironside at the first Battle of Brentford in 1016; and the second Battle of Brentford in 1642. Built in 1868 from Kentish ragstone, Saint Paul's Church is one of Brentford's two current Anglican parish churches, and a distinct landmark. Its spire is clearly visible. The architect was H. Francis and James Montgomrey was a principal subscriber and chairman of the building committee. In 1959 and 1961 the parishes of the nearby churches of Saint George and Saint Lawrence were amalgamated with Saint Paul. Inside the church is a painting by local artist Johann Zoffany called Christ's Last Supper. It was originally intended to be installed in St Anne's Church, Kew, but the local people objected, and therefore in 1887 it was installed in Saint George's Church instead. When that church was closed in 1959, the painting was transferred to its present location in Saint Paul's Church. St Faith’s displays all the splendour of Bodley in its simplicity and strength. It rises like a great ship over the housetops and inside the view from the west end leads you naturally to the altar and up to the roof. There has been a church on the site of Brentford's former parish church of Saint Lawrence since the 12th century, but the tower dates from the 15th century, and the remainder of the church was rebuilt in 1764 from brick. There were a number of interesting monuments in the church, including one dedicated to a Maurice de Berkeley, dating from 1189, who was buried in the original church. The church was closed in 1961 and the monuments removed, and the parish was united with Saint Paul's. The church has now been in a derelict state for more than half a century but the graveyard still holds the Ronalds vault where Hugh Ronalds and numerous members of his family are buried. 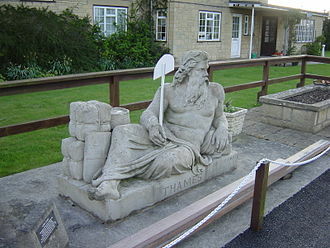 A war memorial stood outside the church until 2009, when it was moved to Brentford Library. The church, opened in 1866, was built for Irish railway construction workers, by an architect named Jackman. An unconsecrated chapel was built from subscriptions raised from 57 prominent inhabitants on the site in 1762; previously the parish was part of Ealing. The old chapel was demolished in 1886 and eventually replaced by the current building designed by A. W. Blomfield. The painting of the Last Supper by Zoffany was transferred to the new church. 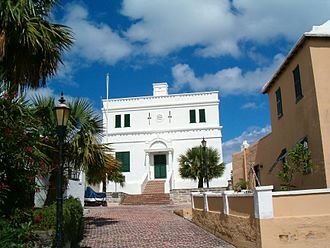 It was closed in 1959 and used as the home for the Musical Museum from 1963 until the Museum moved to new premises. It is now (2017) being converted into flats. Gunnersbury Park Museum is in Gunnersbury House, narrowly in Gunnersbury (the north-west of Chiswick) containing artifacts and former furnishings of the Rothschild family, who were culturally and financially pre-eminent across France, Germany, the Netherlands, the United Kingdom and North America. Kew Gardens is visible from the scattering of high rise buildings towering over the town and some of the mid rise ones. The Weir public house, formerly 'The White Horse', was where the artist J. M. W. Turner lived for one year at the age of ten. He is regarded as having started his interest in painting while living there. Later he lived in Isleworth and Twickenham. Brentford Dock came to single use and engineered enlargement as a freight terminus of the Great Western Railway. It was designed by Isambard Kingdom Brunel and built between 1855 and 1859 at the confluence of the River Thames and River Brent - part of the land was James Montgomrey’s Montgomrey's Wharf. A spur line from the GWR at Southall was constructed to the Brentford Dock railway station to facilitate easy transferral of freight from lighters and barges on the Thames to GWR-served destinations in the west of the country. The dock was redeveloped as residential accommodation from the early 1970s, and little industrial archaeology remains. However, Dock Road still retains some of its original fan pattern cobblestone road bed and examples of Brunel's broad-gauge 'bridge section' rail can be seen there. The Brentford Dock flats (originally named the Tiber Estate) were built alongside formerly important transport infrastructure as Brentford is the terminus of the Grand Union Canal, originally the Grand Junction Canal. 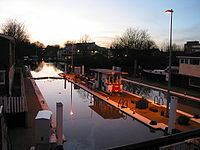 This waterway is still in use for leisure traffic as part of the Grand Union Canal. Brentford Public Library is a Carnegie library, built by the architect Nowell Parr and opened in 1904. Outside the library is Brentford War Memorial, accompanied by three smaller war memorials. Brentford Baths (1896), also by the architect Nowell Parr, is a Grade II listed example of late Victorian architecture. The London Museum of Water & Steam houses the world's largest working beam engine, and its narrow cuboid tower is an emblem of the town. The Butts Estate, a Georgian square and associated conservation area, contains several Grade II listed buildings some dating back to 1680. Griffin Park is home to Brentford Football Club, and former home of Chelsea Football Club Reserves, plus (from 2002 until 23 September 2005 it was the home of the London Broncos rugby league club – subsequently they were renamed Harlequins RL and transferred to The Stoop). Brentford F.C. is a professional English football club based in Brentford in the London Borough of Hounslow. It currently plays in the Football League Championship. It was founded in 1889 by members of the defunct Brentford Rowing Club and plays its home games at Griffin Park, its home stadium since 1904. The club has a long-standing rivalry with near neighbours, Fulham. Brentford's industrial status and the Great West Road are notable facets of Aldous Huxley's 1932 novel Brave New World. Set in London in AD 2540 (632 A.F.—"After Ford"), the influential dystopia anticipates changes in reproductive technology, sleep-learning, psychological manipulation, and classical conditioning that combine to change society profoundly. The BBC Three sitcom People Just Do Nothing is set in and around Brentford. The Brentford Trilogy, a series of "far-fetched fiction" novels by Robert Rankin, humorously chronicle the lives of a couple of drunken middle-aged layabouts, Jim Pooley and John Omally, who confront the forces of darkness in the environs of West London, usually with the assistance of large quantities of beer from their favourite public house, The Flying Swan. ^ "Bronze chariot fitting from Brentford". museumoflondon.org.uk. Archived from the original on 12 March 2007. ^ "Tour 1: Antiquarians, collectors and dealers: Thomas Layton". museumoflondon.org.uk. Archived from the original on 27 May 2011. ^ "The Thomas Layton Collection, Inscription on the Brentford Monument". 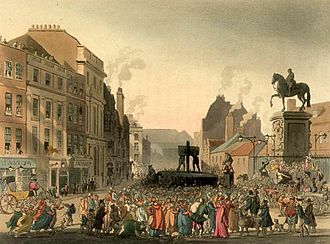 Thomaslayton.org.uk. Archived from the original on 2012-09-14. Retrieved 2014-06-03. ^ Sharpe, Montagu (1926). Some accounts of bygone Hanwell. Page 7,8,9, & 10. Brentford Printing and Publishing Coy., Ltd. London. UK. ^ "Brentford Festival 2010". Brentfordfestival.org.uk. Archived from the original on 1 June 2014. Retrieved 3 June 2014. ^ Brentford, The Environs of London: volume 2: County of Middlesex (1795), pp. 39–58.. Date accessed: 18 August 2007. ^ a b c Ronalds, B.F. (2018). "The Montgomrey Family of Brentford: Timber Merchants and Benefactors". London’s Industrial Archaeology. 16: 57–69. ^ "Heidelberg – Heidelberg UK". Uk.heidelberg.com. Retrieved 2014-06-03. ^ "Contact Us Archived 1 March 2012 at the Wayback Machine." JCDecaux UK. 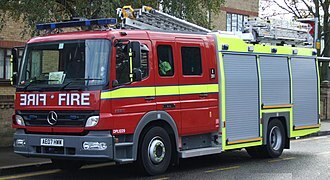 Retrieved on 28 September 2011. "JCDecaux UK – Head Office 991 Great West Road Brentford, Middlesex"
^ "Corporate." SEGA. Retrieved on 31 January 2011. "SEGA Europe Ltd. 27 Great West Road Brentford Middlesex TW8 9BW United Kingdom." ^ "Brentford Monument". BHS Project. Retrieved 2 August 2014. ^ "Churches: Brentford". British History. Retrieved 2 February 2015. ^ "Johann Zoffany". Brentford local website. Retrieved 2 February 2015. ^ "Saint Faith's Church". Brentford History. 21 December 2013. Retrieved 2 February 2015. ^ Weinreb, Ben & Hibbert, Christopher (1992). The London Encyclopaedia (reprint ed.). Macmillan. p. 750. ^ "Ronalds Family Vault". Sir Francis Ronalds and his Family. Retrieved 9 May 2018. ^ "West Brentford War Memorial Restoration". Brentford History Project. Retrieved 2 February 2015. ^ "HISTORY OF THE DOCKS BRENTFORD". Archived from the original on 5 July 2008. Retrieved 7 January 2008. ^ "Brentford Dock Residents - Brentford and Brentford Dock history". ^ "Guide". TalkFootball. Retrieved 2014-06-03. 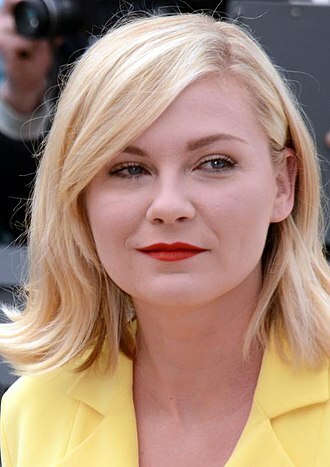 ^ Nolan, Emma (14 November 2018). "People Just Do Nothing season 5 location: Where is the new series filmed?". Express.co.uk. Retrieved 28 January 2019. People Just Do Nothing is a mockumentary set in Brentford, West London. 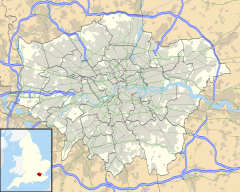 Wikimedia Commons has media related to Brentford, London Borough of Hounslow. Chisholm, Hugh, ed. (1911). "Brentford" . Encyclopædia Britannica. 4 (11th ed.). Cambridge University Press. The M4 corridor is an area in the United Kingdom adjacent to the M4 motorway, which runs from London to South Wales. It is a major high-technology hub, important cities and towns linked by the M4 include London, Bracknell, Reading, Swindon, Bristol, Newport and Swansea. 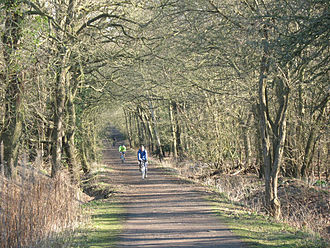 The area is served by the Great Western Main Line, including the South Wales Main Line. The eastern end of the English M4 corridor is home to a number of technology companies, particularly in Berkshire, Swindon. For this reason part of the M4 Corridor is sometimes described as Englands Silicon Valley. Slough, Maidenhead, Reading and Newbury are the towns in the Berkshire stretch of the M4. Reading is home to information technology and financial services businesses, including Cisco, Microsoft, ING Direct, Prudential, Yell Group. Vodafone has a corporate campus in Newbury, O2 plc is in Slough. Maidenhead is the home Hutchison 3G UKs Headquarters and Tesla Motors UK Head Office, investment has gradually spread westwards since the 1980s. Boston Manor is a London Underground station serving the Boston Manor area between Brentford and Hanwell in west London. The station is on the Heathrow branch of the Undergrounds Piccadilly line, the station is on a street-level bridge over the line on Boston Manor Road in the London Borough of Hounslow, just to the south-west of the boundary with the London Borough of Ealing. It is in Travelcard Zone 4, Boston Manor station was opened by the District Railway, on 1 May 1883 on a line to Hounslow Town. The station was originally named Boston Road, the signs on the platforms gave the name as Boston Manor for Hanwell. Electrification of the DRs tracks took place between 1903 and 1905 with electric trains replacing steam trains on the Hounslow branch from 13 June 1905, the station was given its current name on 11 December 1911. Between 1932 and 1934 the station was rebuilt to replace the 1883 station building, the new station was designed by Stanley Heaps in the modern European style used elsewhere on the Piccadilly line by Charles Holden. An eastbound Piccadilly line train leaves for Cockfosters. Northfields depot, viewed from the road bridge. Brentford Dock (the new marina), 6 November 2007(2007-11-06). Moored boats at low tide in the old Brentford docks (the old marina).